Download "ALARM SYSTEMS Ord. No. 08-02 Adoption Date: September 9, 2008 Publication Date: September 17, 2008 Effective Date: October 16, 2008"
ARTICLE II. ALARM SYSTEMS* *State law references: Burglar alarm systems, V.T.C.A., Local Government Code 218.001; fire alarms, V.A.T.S. Insurance Code, art. 5.43-2. DIVISION 1. GENERALLY Sec. 26-31. Definitions. 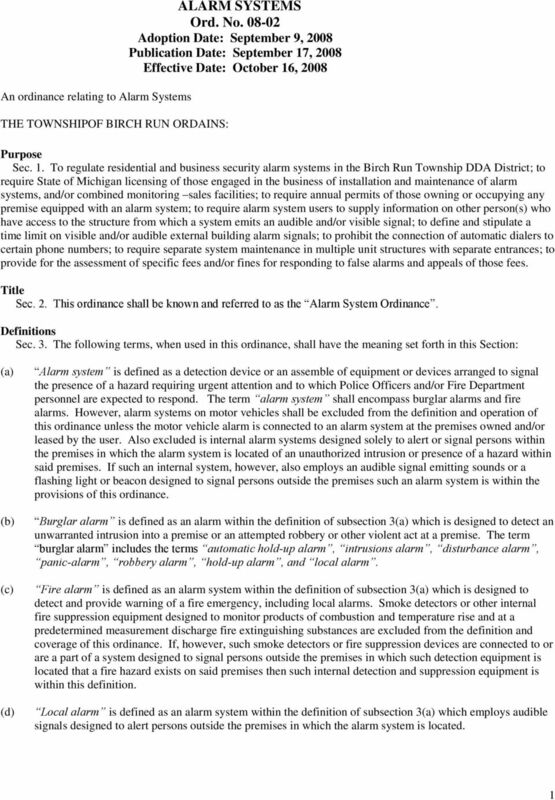 This chapter shall be known as the "Village of Hustisford Alarm Systems Ordinance." Chapter 114 ALARM SYSTEMS [HISTORY: Adopted by the Village Board of the Village of Hustisford 3-28-1994 as Title 5, Ch. 4 of the 1994 Code. Amendments noted where applicable.] Police Department See Ch. CITY of NOVI CITY COUNCIL Agenda Item 3 May 23,2011 cityofnovi.org SUBJECT: Consideration of adoption of Ordinance No. 11-23.27, to amend Chapter 22, "Offenses," Article II, "Offenses Against Public Administration,"
Chapter 67 ALARM SYSTEMS 67-1. Title. 67-2. Declaration of purpose. 67-3. Definitions. 67-4. Administrative rules. 67-5. Automatic dialing devices. 67-6. Direct connections to the Police Department. 67-7. Chapter 67 ALARM SYSTEMS 67-1. Purpose. 67-2. Title. 67-3. Definitions. 67-4. Required information. 67-5. Notification prior to testing. 67-6. Reporting of false alarms. 67-7. 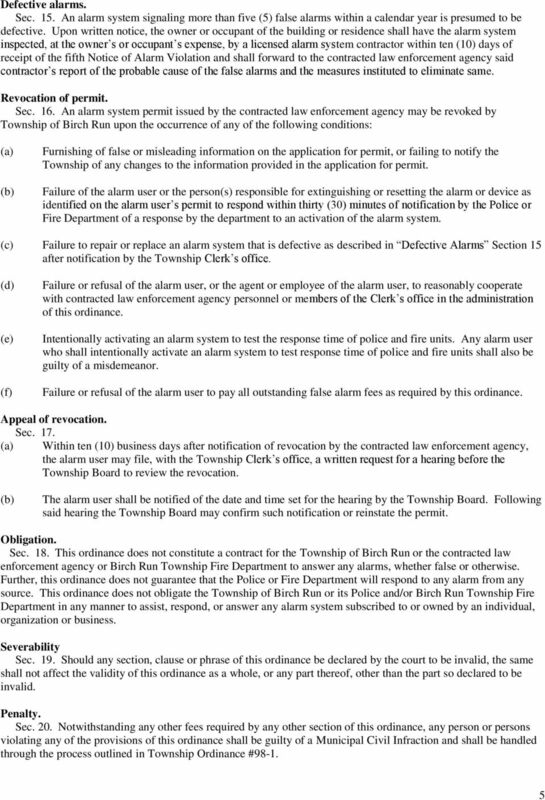 Fines for false alarms. 67-8. Chapter 103 Alarm Ordinance 1. PURPOSE. ORDINANCE NO. 18 The Jefferson County Board of Supervisors does ordain as follows: 18.01 TITLE. This ordinance shall be known as the Jefferson County Alarm Systems Ordinance. 18.02 DECLARATION OF PURPOSE. 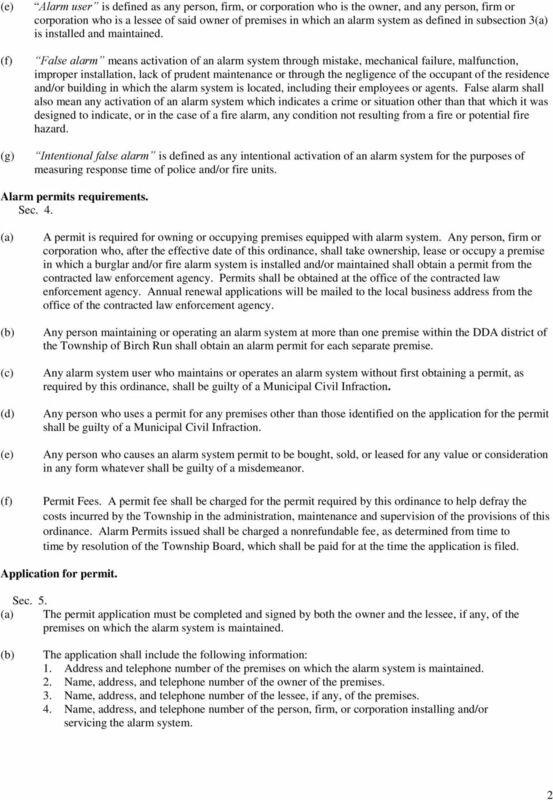 2015-23 AN ORDINANCE BY PRINCETON CONCERNING ALARM SYSTEM REGISTRATIONS AND AMENDING THE "CODE OF THE BOROUGH OF PRINCETON, NEW JERSEY, 1974 AND THE "CODE OF THE TOWNSHIP OF PRINCETON, NEW JERSEY, 1968". (1) Participation in this agreement does not bind any municipality to respond to any given call for assistance. 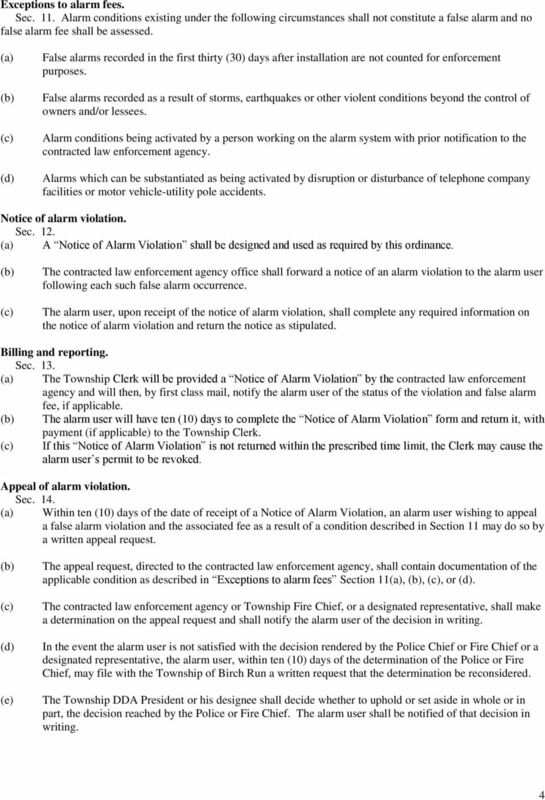 DRAFT CITY/COUNTY OF, TENNESSEE POLICE ALARM ORDINANCE WHEREAS, the purpose of this ordinance, finds that excessive false alarms unduly burden the Police Department s limited law enforcement resources. ALARM ORDINANCE. 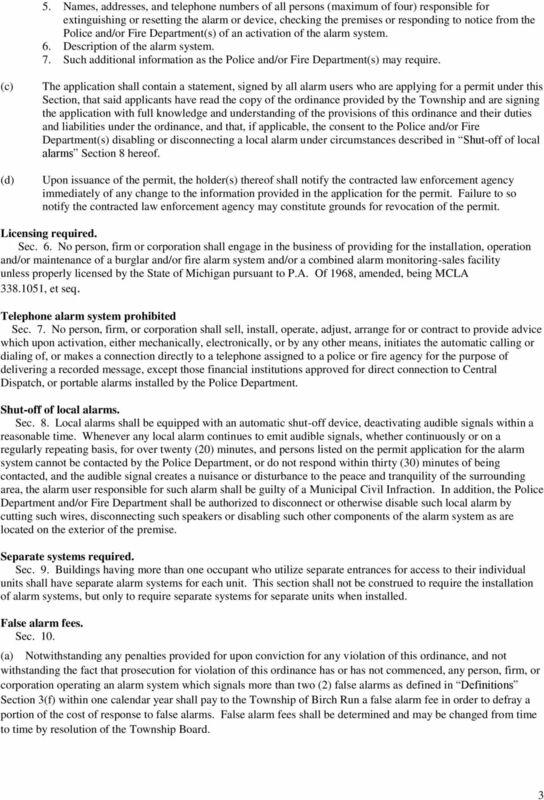 (b)alarm permit means a permit issued by the Town allowing the operation of an alarm system within the Town. SEC. 4-7.04 STANDARDS AND ADMINISTRATION. Chapter No. 93 ] PRIVATE ACTS, 2000 1 CHAPTER NO. 93 HOUSE BILL NO. 3277. By Representative Sands. Substituted for: Senate Bill No. CITY OF ALBANY, GEORGIA DIVISION 2. FALSE ALARMS* *State law references: Restrictions on operation, installation, maintenance, etc., of electronic security systems by counties and municipalities, O.C.G.A.